In this study, vertically aligned zinc oxide (ZnO) nanorod (NR) arrays were grown with the 2-step method. Spin coating was used to apply the seed layer, and by increasing the number of repetitions (n), higher thickness of the seed layer was achieved. The effects of different seed layer thicknesses, spin coated at different rotational speeds (v) and how the variables (v and n) influence the morphological and crystal properties of the resulting ZnO NRs were analyzed. The effects of 1, 3, and 5 (n), with (v) of 3000 or 4000 rpm were investigated, and the formed seed layers were characterized by using scanning electron microscopy (SEM) and X-ray diffraction (XRD) profiles. The ZnO NR arrays were grown by a chemical bath deposition method because of its simplicity and ease of use. Full width at half maximum (FWHM) analysis was conducted on the XRD chart and Raman spectrum to analyze the grain size and Wurtzite distortion of the ZnO NRs. A lower FWHM value was attributed to the lower number of structural disorders in the ZnO NRs, which equated to the most stable or structured Wurtzite structures in the ZnO NRs, achieved at the lowest FWHM value. The lowest FWHM for (002) XRD peak was obtained at 0.35° for ZnO NRs grown with a seed layer spin coated at 4000 rpm once. The crystallite size calculated by Scherrer’s equation gave a size of 25.14 nm. The lowest FWHM for E2(High) Raman peak was obtained at 6.00 cm–1 for ZnO NRs grown with a seed layer spin coated at 4000 rpm three times. Numerous studies of zinc oxide (ZnO) materials have been conducted because of the semiconductor properties with direct bandgap energy of 3.37 eV and high exciton binding energy of 60 meV at room temperature. One motive for such studies is that one-dimensional (1-D) ZnO materials have excellent optical properties, having varying shapes such as nanorods/nanowires, nanobelts or nanoflowers. They can be applied as chemical sensors, photodetectors, field-effect transistors (FET) or solar cells, amongst other uses. ZnO material is environmental friendly and does not have a harmful effect on the environment. Due to their biocompatibility, ZnO materials can be applied to biochemical, medical, or other related fields. A study conducted by (Kashif et al., 2012) was conducted to compare ZnO nanorods (NRs) made by KOH-based and monoethanolamine-based seed layers (Kashif et al., 2012). ZnO NRs with higher electrical conductivity are better suited to power-saving optoelectrical devices, while those with better crystallinity alignment have properties such as higher longevity and stability and are suitable for optoelectronic applications. Vertically aligned ZnO NRs with a hexagonal Wurtzite structure have high piezoelectric and pyroelectric properties. They can also be used to grow nanotubes or core-shell nanowires. One of the methods to grow 1-D ZnO nanostructures is the vapor-liquid-solid (VLS) method, in which a substrate with seed droplets is exposed to vapor particles in a chamber to form solid nanowires. Another method to grow 1-D ZnO nanostructures is chemical vapor deposition (CVD), which involves the use of a gas chamber and application by thermal treatment. Several papers have mentioned the importance of seed layers in growing vertically aligned ZnO NRs. By controlling the thickness of the seed layer, the resulting nanorod size, alignment and density can be manipulated (Peiris et al., 2013). Higher seed layer thickness yields increased grain and particle size (Ghayour et al., 2011). In the case of a very thick seed layer, its density decreases along with the nucleation sites (?kizler & Peker, 2014). One method to control the grain size of the seed layer is to control the temperature of the annealing treatment employed (Wahid et al., 2013; Yoon et al., 2015; Gautam et al., 2016). Thermal treatment of the seed layer also affects the (002) crystallinity after the seed has grown into nanorods. A combination of seed layer thickness and thermal treatment makes ZnO NRs suitable for photovoltaic applications (Sholehah & Yuwono, 2015). The vacancy of oxygen atoms or molecules on the seed surface increases with the temperature. (Dou et al., 2015) researched another method of controlling ZnO NR morphology by adding Ga dopants to the ZnO seed layer (Dou et al., 2015). The addition of a dopant affects the density of the seed layer, and by changing its concentration, the resulting diameter or length of the NRs can also be controlled. A similar method can be applied with the addition of polyethyleneimine (PEI) chemical to the seed layer solution and/or NR growth solution (Huang et al., 2011; Poornajar et al., 2016). Another method to control the seed layer is to change the concentration of the seed layer solution (Pourshaban et al., 2015) or to increase the length of the growth process (Kurda et al., 2015). With a higher annealing temperature, the crystallinity in the (002) direction experiences higher intensity, which leads to vertically alignment and longer NR length (Kim et al., 2014a). Post-hydrothermal treatment of the ZnO NRs also affects their crystallinity (Sholehah et al., 2017). Many studies have been conducted on vertically aligned ZnO NRs because of their improved photovoltaic properties. 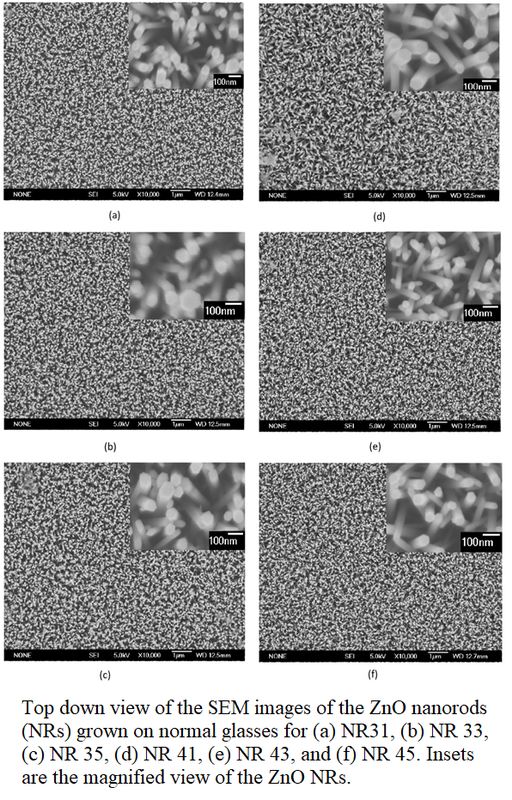 This paper aims to provide an alternative way of studying the effects of various thicknesses of the seed layer by spin coating performed with differing numbers of cycles (n). The spin coating method was chosen due to its simplicity and ability to control the thickness of the deposited seed layer by adjusting the rotational speed (v). Characterizations by X-ray diffraction (XRD) and Raman spectroscopy were conducted to provide morphological analysis. Full width at half maximum (FWHM) analysis was performed on the two characterizations to provide more depth to the morphological analysis. The analyses reveal that the FWHM value is linked to the variable n in the form of charts. The research conducted by Song and Lim concluded that by adding dopant atoms to the seed layers and by manipulation of seed layer thickness, the morphology and crystallinity of the ZnO NRs were also affected (Song & Lim, 2007). Several studies have combined the techniques of zinc seed layers containing dopant atoms with TiO2 materials to increase the photovoltaic parameters (Kim et al., 2014b). In this paper, a method to control the morphology and density of the seed layer is proposed by changing the number of cycles (n) of the spin coating at different rotational speeds (v) of 3000 and 4000 rpm. By controlling the number of n, control of the surface of the seed layer and the sizes of the resulting ZnO NRs, together with their crystallinity, is possible. The effects of the number of the spin coating cycles (n) and the rotation speed (v) have been discussed in relation to the properties of the ZnO seed layer and the growth of NRs. When the seed layer was spin coated at a higher speed (v = 4000 rpm), it tended to become more homogenized, while the preferred orientation deteriorated along the  direction. Similar deterioration was also observed in the case of v = 3000 rpm. It is believed that a high seed layer density leads to ZnO NRs with high density and fewer empty spaces between each ZnO NR. Under such a condition, the resulting ZnO NRs became less tilted and the XRD results showed stronger  ZnO crystallinity. The FWHM of the  XRD peak corresponded to the grain or crystal size of the ZnO NRs growing in the c-axis vertical direction. The lowest FWHM of the  XRD was obtained by NR31 (v = 4000 rpm) at 0.36° and NR41 (v = 4000 rpm) at 0.35°. The calculated crystallite sizes from Scherrer’s equation yielded 24.44 nm and 25.14 nm consecutively. The crystallite sizes from all the v and n parameters did not show a wide range of size variation, which showed that the crystallinity of the ZnO NRs was relatively defined for all cases of v or n. Higher n yielded a higher FWHM of the  peak, while higher v resulted in lower FWHM. The Raman spectrum showed two peaks, corresponding to E2(High) and E2(Low) modes. FWHM analysis of E2(High) corresponded to the Wurtzite structure of the ZnO NRs, and the lowest FWHM of E2(High) Raman was preferred due to the lower probability of distorted Wurtzite structure. The lowest FWHM of the E2(High) Raman peak at v = 3000 rpm was produced by NR35 at 6.63, while for v = 4000 rpm, the lowest FWHM was produced by NR43 at 6.00. For v = 3000 rpm, higher n yielded a lower FWHM of E2(High) Raman, while for v = 4000 rpm, the FWHM increased at NR45, possibly due to a larger number of oxygen atoms during the ZnO NR growth.